Michigan is so ethnically diverse, you almost feel like you’ve been abroad when you visit some of our towns and cities. One of the best examples is Frankenmuth, known by many for its Bavarian theme and, by many more, as the home of Bronner’s CHRISTmas Wonderland. To others, it’s the place with the best family-style chicken dinners (next to mom’s) at Zehnder’s of Frankenmuth, and the Bavarian Inn and Restaurant. But there’s so much more to do in Frankenmuth, including festivals and events, a waterpark, great shopping, and other attractions. Here’s a rundown of what’s going on in Frankenmuth. If you’re looking for events, Frankenmuth has something going on in every season. Starting in January, there’s Zehnder’s Snowfest, one of the nation’s top ice sculpting events, featuring a petting zoo, other activities for kids, fireworks, a Tap Room Takeover for adults with hors d’oeuvres and craft beer, and a photo contest. Bringin’ Back the 80s Festival in April is a rip-roaring blast from the past. The Summer Music Fest in August offers everything from polkas to rock and roll, and Oktoberfest in September features bands, beer, wiener dog races, beer, dancing and, of course, beer. Races are another Frankenmuth favorite, dating back 40 years with the Volksläufe, “The People’s Race,” which now draws nearly 2,500 runners and walkers. Volksläufe is the second of three Frankenmuth Jaycees races, alongside Winterlaufe and Bruckelauf. Another popular race that’s new on the running scene is the Frankenmüdder, a three-mile “boot camp” run with 17 obstacles that require climbing, running, swimming, crawling and plenty of mud throughout. Proceeds go to support Michigan’s Military & Space Heroes Museum. Another big draw for families is Zehnder’s Splash Village, Michigan’s largest indoor waterpark and one of just a few waterparks in the U.S. with a retractable roof. This spectacular waterpark includes a “six-story family raft ride and super loop drop slide; zero-entry activity pool with water geysers, water basketball and volleyball, Action River, Splash Landing play area, Dumping Bucket, our four story tube slides, the Giggling Gorge and Perilous Plunge; relax in the Whimsical Whirl Hot Tub or just float along the Lazy River.” Regardless of your group’s age range, Zehnder’s Splash Village offers endless fun, summer or winter. For fun outdoors, Frankenmuth has diverse offerings, including the Bavarian Belle Riverboat, “an authentic stern driven paddlewheel riverboat” with one-hour narrated historical tours of the Frankenmuth area, and the Frankenmuth Aerial Park, offering zip line and aerial rope courses. Johnny Panther Quests Ecotours features scenic boat tours through the Shiawassee National Wildlife Refuge and State Game Area and the Cass River in Frankenmuth (aka Michigan’s everglades) and is rated a “Great Experience for Members” by AAA; from bald eagles to beavers, you’ll enjoy a relaxing look at wildlife up close. Two more great destinations for families are Wilderness Trails Zoo (lions and tigers and camels, oh my!) and Grandpa Tiny’s Farm, “a working historical and petting farm” that also offers horse-drawn wagon rides and seasonal u-pick lavender and pumpkins. For grownups only, Frankenmuth also has plenty of opportunities to partake in libations and enjoy the company of friends. Among these are two mobile tours, starting with Frankenmuth Fun Ships Tasting & Tours, offering wine and/or chocolate tasting tours aboard a boat or in store. The PedAle Trolley, a trolley powered by up to 16 people, offers a variety of two-hour tours stopping anywhere you like, from pubs and restaurants to stores, shops and other attractions. No matter what reason you choose to visit Frankenmuth, one thing is for sure; your group will want to save time for shopping at some of the best shops in Michigan. A great place to begin is at the Bavarian Inn Castle Shops in the lower level of Bavarian Inn Restaurant. Then take a walk to Abby’s of Frankenmuth (part of the Cass and Main Collection), a downtown anchor and favorite women’s shop. Nearby are Adorn Boutique, also for women, and Amazin’ Mitten, with something Michigan for everyone. Then get your authentic German clothing at Bavarian Specialties (Can you say lederhosen? ), or shop for your home at Cass St. Decor, where fabulous is the norm. If you want fun things for the young ones, try Frankenmuth Toy Company/Kite Kraft, combining fun and learning. Mother Earth’s Toy Jungle is your one-stop shop for toys old and new. 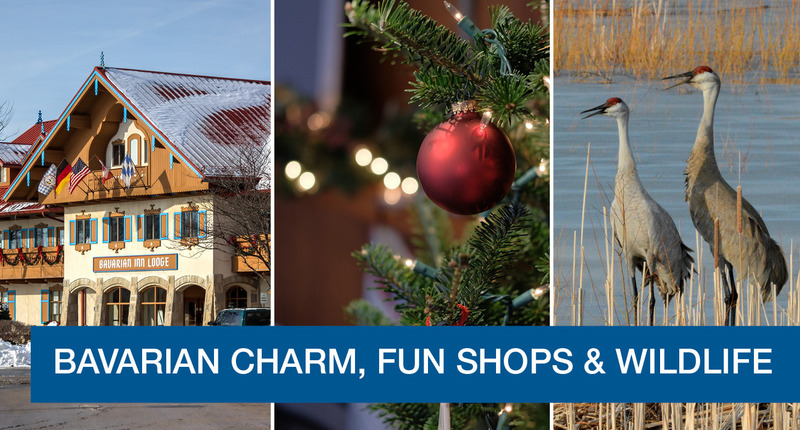 These few are representative of the dozens of unique, fun and yummy shopping venues in and around Frankenmuth.